The ThingWorx platform is a complete end-to-end technology platform that is designed for industrial IoT. It facilitates the tools and services that are required to develop and set-up connectivity, analysis, production of other aspects of IoT development. The ThingWorx IoT platform is a collection of modules that deliver the flexibility, capability, and agility establishment required to implement IoT applications. ThingWorx empowers businesses to develop and deploy powerful applications rapidly and augmented reality (AR) experiences. ThingWorx is the first platform that connects the people, systems, things, connection operations, connected products, connected applications, etc. 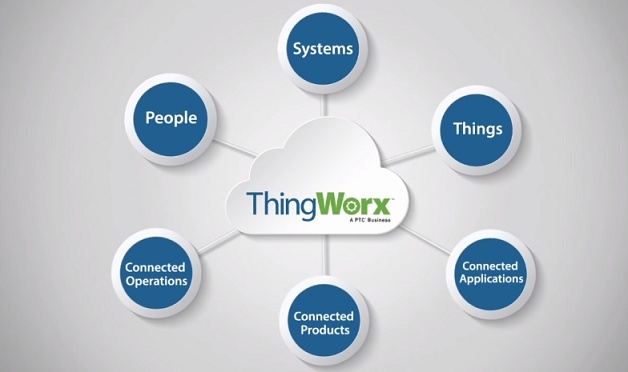 ThingWorx reduces the time, cost, and risk which are required to build the IoT applications. It deploys the application 10-time faster with model-based development. ThingWorx allows you to deploy how you like by providing the complete application design, runtime, and intelligent environment. The ThingWorx IoT platform also has flexibility and scalability to adapt that application in future. This platform specially designed to provide the functionality for the protection as well as the scalability to develop as the commercial enterprise expands. It includes a platform module that comes together with the ThingModel. The ThinkModel is a truthful digital illustration of items that enables experience, studies, and quick apps delivery without any difficulty. The ThingWorx platform has the flexibility to be deployed on-premises, inside the cloud or a hybrid or both of these platforms. ThingWorx offers several key components for application building. This component includes Composer, Mashup builder, storage, search engine, collaboration, and connectivity. The Composer provides a modeling environment for designing , and testing. The Mashup builder is used for dashboard building through common components such as buttons, lists, wikis, gauges, etc. ThingWorx uses a search engine known as SQUEAL, for search, query, and analysis.